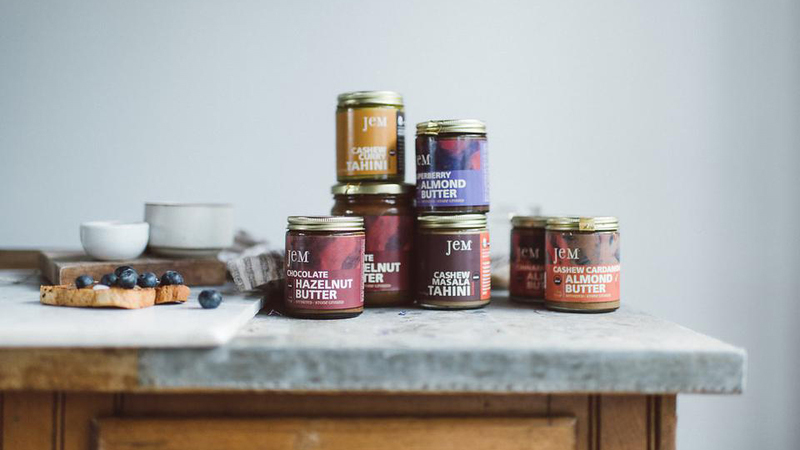 Jem Organic Nut Butters, a line of sweet and savory nut butters that are both indulgent and functional, are crafted with care in Bend. The people behind Jem are a small and dedicated group of health enthusiasts who honor practices and ingredients that “wholly embody goodness”, and who believe in the power of food to not only sustain, but to “nourish, inspire and build community”. Their organic nut butters use wholesome and natural ingredients that are 100% OTC-USDA certified organic, Gluten Free, non-GMO and vegan. They are also delicious, with flavors like Cinnamon Maca, Superberry, and Cashew Cardamom almond butters. They source fair trade ingredients of the highest quality and which are truly raw, and free from pesticides, gluten, dairy, soy and processed sugar, so you can indulge in Jem guilt-free. For maximum flavor and nutrient absorption, they sprout the nuts for 24 hours before they stone ground them in genuinely small batches that can take up to 48 hours to process.